Well, we’re at it again. Do you remember the 1950s and 60s when Americans were spending thousands of dollars to build bomb shelters – against the Soviet threat of nuclear war? It’s happening once more. So says a recent flurry of news articles, reporting on a Los Angeles-based company which constructs underground shelters that protect their owners from nuclear-chemical-biological hazards. 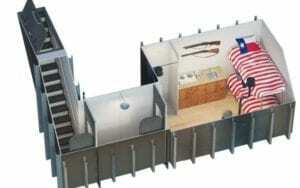 Why this sudden popularity in bomb shelters? Ron Hubbard, owner of Atlas Survival Shelters, has seen a major increase in sales of his shelters which range from $35,000 for the basic creature comforts, to multi-million dollar underground complexes. He attributes his booming sales to North Korea’s recent threats of nuclear attacks against the United States. Anxiety over nuclear missiles isn’t the only fear that plagues Americans. One cannot turn on the radio or visit a web page on the internet without being confronted with advertisements about ways to protect yourself against the next financial crisis – which, they say, is bound to be far worse than the collapse of 2008. So people spend thousands on precious metals, diamonds, and other “fool-proof” measures to protect one’s financial independence. And what about the threat of violent crime? Numerous articles have appeared over the last year, featuring homes that have been turned into arsenals – against what? 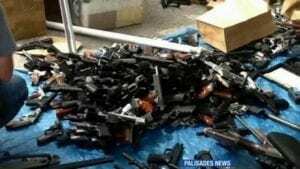 One California man, Jeffrey Lash of Pacific Palisades, was found dead in his SUV, his home turned into an armory of 1,200 weapons and 6 ½ tons of ammunition. Near the same time the City of LA announced it was melting down over 7,000 weapons it had recently confiscated from homes. What in the world are people afraid of? Race riots? Violent crime? Why do people build their own H-Bomb-proof/Radiological-biological chemical hazard-proof/Tornado-proof shelters? They want security. Why do people stockpile weapons until their homes are virtual armories? They want security. Why do people accumulate wealth to the point that they have many times more than any human being requires? They want security. They want to protect themselves from every conceivable danger, both those unforeseen and those vividly portrayed before their eyes. Security sells. But there is something fundamentally wrong, even pathological, about this desperate quest for and preoccupation with self-protection. It’s all a poor substitute for the real thing – God. What can these things offer that God cannot? The Bible describes God as a fortress, a shield, a high place, a rock, a strong tower – everything we need to protect us from all harm on every side, above and below (e.g. Psalm 18:2; 46:1). Plus, with God as your unfailing and impenetrable security, you don’t risk all hidden dangers these man-made substitutes hide. You won’t have to burrow in the ground and alienate yourself from the community just to feel safe. Neither would you be in danger of your own weapons which accidentally take the lives of hundreds every year. You won’t be targeted for robbery (and death) by those who covet your wealth. And when it comes to security, look at what God can do. For forty years God provided food, water, clothing, and health for 2 ½ million people in a barren wasteland (Deuteronomy 29:2-6). God defended the tiny city-state of Judah, which had no army to speak of, against the invading Assyrian war machine simply by dispatching one angel, who destroyed the Assyrian force of 185,000 strong, forcing its king to retreat (2 Kings 18-19). Indeed, King David, who fought hand-to-hand with the enemy in countless battles should not have survived to old age. Statistically, the odds were too great and he was surrounded by too many foes to avoid a violent death. Yet David – who trusted in God as his strength, shield, and fortress – died peacefully in his sleep at a ripe old age, surrounded by family, friends, and loved ones (1 Chronicles 28-29). He summed up his life in the words of Psalm 34:4, “I sought the LORD and He heard me and delivered me from all my fears.” When he trusted in the LORD, nothing David feared – not poverty, not abandonment, not violent death – came upon him. Though he admitted, “Many are the afflictions of the righteous,” yet he clarified it by saying, “But the LORD delivers him out of them all” (Psalm 34:19). Friend, don’t get carried away by the world’s insane pursuit after security by accumulating wealth, weapons, and war-proof habitations (Matthew 6:19-33). Placing yourself in the hollow of God’s almighty hand and resigning yourself to His blessed will is the greatest security measure you can possibly take (Psalm 91:3-7). And it doesn’t cost a penny. Dear Father in heaven, here and now I acknowledge You as my fortress, my shield, and the supplier of my needs. You, O God, are my ultimate source of security and salvation from all harm and evil. You hold my very existence in Your hands. My heart beats, my lungs breathe, and every organ in my body functions and does its work by Your command. Lord, I therefore place myself and all I love into Your almighty and loving hands. Save me, O God, I am Yours. Amen.